Pat Cox (BSCNE ’10) broke onto the art scene during his summer internships with Matt Construction Co. 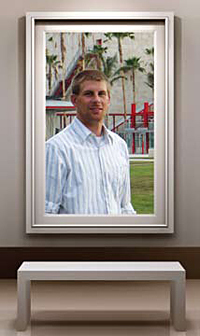 There, he worked on the high-profile Los Angeles County Museum of Art (LACMA) Transformation project. Matted: Pat Cox (BSCNE ’10) turned his internship experience into full-time employment at the Matt Construction Co. Phase 1 saw the demolition of a massive parking structure to make room for a stunning new three-story showcase for modern art, the Broad Contemporary Art Museum (BCAM). Designed by award-winning French architect Renzo Piano, the museum required artful construction engineering management as well. The architect equipped the 72,000- square-foot gallery with a dramatic external covered escalator that transports visitors up out of a landscaped green space to a third floor entrance. Each floor of the building is roughly 20 feet in height. Cox says this is both aesthetically pleasing and practical; the tall ceilings allow for large doors that can accommodate large pieces of artwork. Similarly, a freight elevator in the building’s center was built to withstand substantial loads, far in excess of those imposed by regular freight. The top of the BCAM is essentially one giant skylight. A system of remotely operated solar shades suspended from an intricate metal framework diffuses the harsh California sun. The effect is a striking saw-tooth profile for the roof and a pleasant experience of even natural lighting for art patrons inside. But the artistic concept was not easy to implement. An even bigger challenge was years in the making — tens of thousands of years. 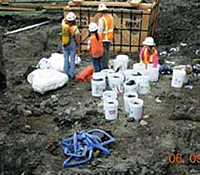 During the demolition phase of the site, located near the famed La Brea Tar Pits, excavation teams uncovered a nearly complete woolly mammoth skeleton and several other prehistoric fossils. All work stopped, the area was taped off, and equipped specialists delicately removed earth inches at a time. Mammoth Disruption: Construction screeched to a halt with the discovery of a nearly complete woolly mammoth skeleton and several other prehistoric fossils. Cox and his team accomplished this by digging out all around the fossil areas and building special crates around and under the bones. Then they used cranes to haul the crates out of the job site, onto semis and off to research facilities, where the valuable remains were properly excavated. The art of communication became one of the lasting lessons of the LACMA project for Cox. Many voices needed to be heard on the project; the engineers, the architect, the museum’s art director, and even community leaders had interests in its progress. Cox, who graduated last spring, is extending that experience with Matt Construction in California as a full-time employee.